Enjoy with your best friends! Help a mother and her baby get closer with this snuggly gift. 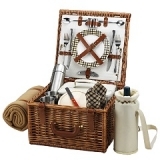 The English style Cheshire Picnic Basket for two. 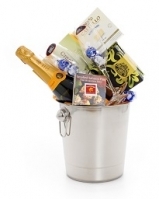 This is your celebratory silver bucket, just add ice as required! 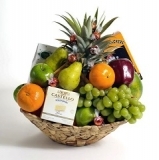 Filled with fresh fruits, cheese, crackers, cookies and truffles. Through Green & Green, I teach companies and individuals how to convey their sentiments. 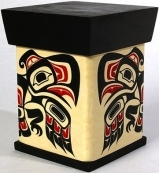 I express their joy, love, apologies, friendships, bonds, celebrations and cultural understanding – all these delivered through the gifts that my company sends every day.My goal is to double my clients’ goodwill. Whatever the message, my job as Chief Gift Officer is to ensure delicious for the recipient. I always want their reaction to be “Wow, that was so thoughtful!” I delight in taking care of the little details – finding the appropriate gift, deciding where and when to send it – to make the biggest impact.I once read a study by social psychologist Denis Regan about the Norm of Reciprocity. What’s that? Well, the idea is that when you give, people automatically want to give back. In his experiment, individuals in one group received a can of Coca-Cola and those in another group did not. Both groups were then approached by a researcher selling raffle tickets. Those who received Coca-Cola bought twice as many raffle tickets as those who did not get a can. In addition, those who received the can of Coca-Cola but reported disliking the seller purchased just as many raffle tickets as those who liked him. In other words, you don’t have to be liked to receive the benefits of being generous! I had a client who wanted to acknowledge an employee who had worked with him all weekend on a project. When he phoned me, the client wanted to purchase a jacket for the employee, to acknowledge his hard work and dedication. I dug a little more into the story and found out that the recipient was married, with two kids. Because of that, I told my client that he would double his goodwill by acknowledging the employee’s wife and kids as well – it would make an excellent impression on the whole family! Suddenly, his gift became twice as meaningful: it was both an apology for taking the employee away from his wife and kids, and a gift that the whole family could enjoy. The client told me the following week that the employee’s wife had called to thank him for his thoughtfulness. This twofold gift was delicious for them because it was a gift that they could enjoy as a family over and over again. The thoughtfulness of your company matters. It speaks volumes about you. Your polished presence matters because it reveals your honour, respect, and acknowledgement. You see, we are all givers. We give our time, energy and money. But it is in delighting that we often fair poorly. In Sir Henry Wotton’s The Elements of Architecture (published way back in 1624! ), it was claimed that, for architecture to be successful, it must possess three elements: Commodity, Firmness and Delight. As business people, you’ll understand that firmness means that the products or services you are selling are well-made. Commodity means that what you provide is useful and people want it. Delight… That’s trickier. From an architectural standpoint, it means that a building must not only be useful and well made, but it must also make people want to enter it. Everybody, more or less, has the first two down pat: commodity and firmness. It is in that third element – delight – where you can really shine. I always think of gifting as injecting delight into the day-to-day affairs of business. We are all givers. It is in delighting that we can double our delicious. It is the little things that you do in giving – like acknowledging the whole family, or respecting cultural traditions – that are the most inexpensive and effective ways to wow someone. A fancy brochure costs thousands of dollars. A web site makeover will cost the same.But in a smile, or generous gesture of thoughtfulness, or offering of simple kindness – that’s where you can double your good will and become delicious and delightful!